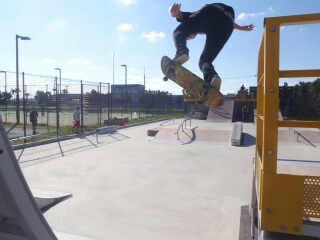 Skateboarder Jack Heckerman getting radical at Gushikawa Skate Park in Uruma City. If you haven’t noticed that skateboarding is very popular on Okinawa then you can definitely confirm you are too old and staying inside your home too much. The skateboarders on Okinawa are growing in numbers at a substantial rate. If you are new to the island let us introduce some of the most popular places to go skateboarding and get radical. Many teenagers these days are riding the streets on skateboards but this generation is not riding Hover Boards from Back to the Future. They have actually regressed back into time, and companies have rebranded the Banana Board. To skateboarders that traditionally ride boards with two inclined noses and tails, these are not familiar. For skateboarders that ride a more familiar shape who live on Okinawa you will be pleased to know that there are some great skate parks on Okinawa. The most well-built skateboard parks are Gushikawa Park in Uruma City, Eco-in Park in Ginowan and Haebaru Park under the Okinawa Expressway in Haebaru Town. There are some other smaller parks scattered around, and on US military bases, but they are hardly worth mention due to their lack of creative design and /or poor quality. And here comes Jason… can’t get much more radical than this. Although there are not many skateboard shops here where the owner of the shop actually skateboards, there’s one particular shop located in Minato, Chatan Town called SaiKicks. SaiKicks Okinawan skateboarder Kota Saikawa is the owner. Saikawa started his skateboard shop because of his spirit of skateboarding. You can find him skateboarding everyday in front of his shop. He explains, ”Skateboarding is my addiction, it is something that I must do everyday”. In front of his shop is a quiet alleyway in which many skateboarders congregate and practice their maneuvers. Saikawa will always make time to come out and skateboard with you. Whether you are a beginner rider, a Banana rider, or a Long board cruiser, Okinawa offers some great terrain to skateboard. There are handfuls of street spots, seaside walkways or all of the skate parks mentioned above that carry hours of fun shred time. The greatest part of about skateboarding is that it doesn’t matter what type of board you ride, what terrain you prefer or what country you are from because skateboarding on Okinawa is strictly about having a good time. 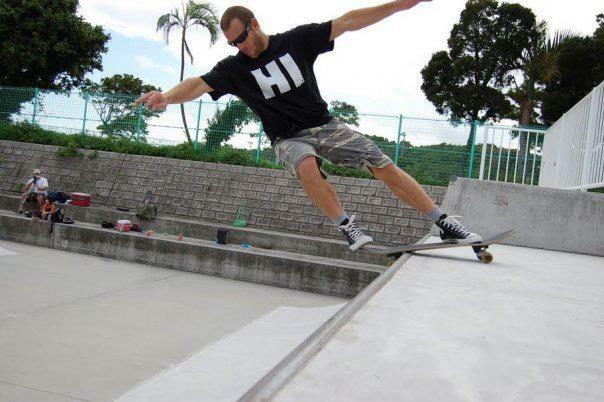 A long time skateboarding resident Bobby Hill says” Okinawa is a great place to meet new skaters and learn new styles. The skateboard scene is the friendliest and the most inviting I have ever experienced”.